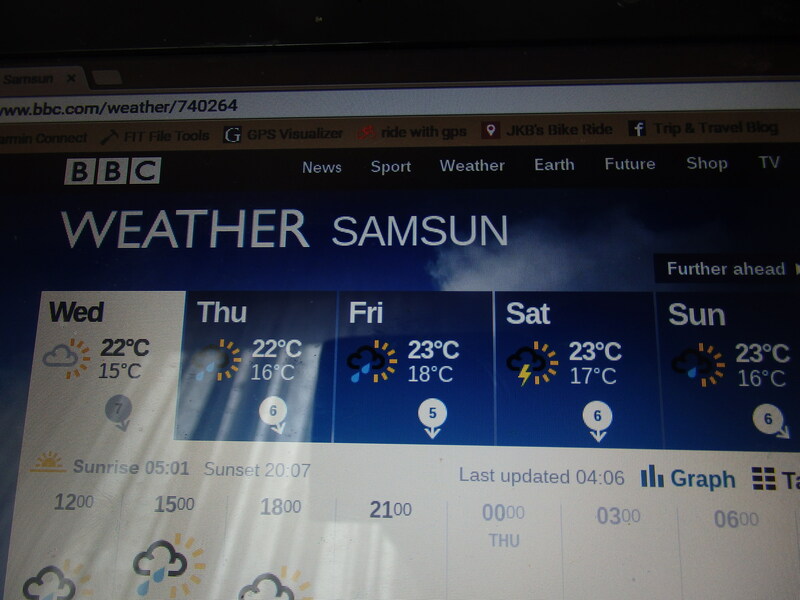 I left Samsun just after the election results had come in at the weekend. From what most people I’d spoken to had predicted the verdict was a pleasant suprise. Very few of the folks I’d stayed with were voting for the current party AKP, (choosing main left party or HDP) and so I was happy with the result because most of my friends were happy. I’ve come across such polar opinions in Turkey, ranging from total Erdogan supporters to real anarchists and so it’s hard for me to tell what the nation’s general thoughts are. I guess it’s like in the UK – I don’t know anyone who votes Tory and yet they have the majority, I guess it’s just the demographic I hang out with and it’s the same in Turkey. Those who I meet (mostly through Couchsurfing/Warmshowers) are more likely to be left leaning. Many of the older generation are extremely fond of Erdogan – they’ve experienced the positive changes he’s made over the last 15 years, which I guess the younger Turks haven’t in the same way. But most agree that he’s gone a little ‘power hungry’, and suggest that it’s important that he can’t have things all his way. It’s also particularly interesting to see the voting regions in Turkey – the map speaks for itself really. The Europe leaning left on the East coast, and the HDP party stronghold in the predominantly Kurdish South-East region. It was strange to be cycling on without all the election propaganda on every street corner – massive posters on buildings, flags in city squares and buses with music blaring cruising along every road in the country. The amount of money invested in those campaigns is obscene, but somehow the country felt a little naked without it. 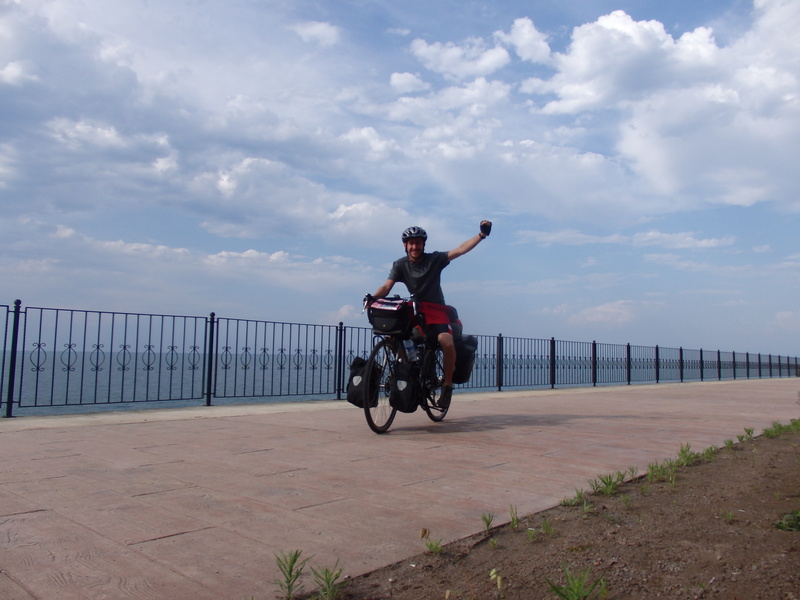 I was excited to finally be cycling along the Black Sea coastal road, but I was quickly disappointed. The road was busy and the sea was barely in sight during my 130km day. I arrived feeling chuffed with my big workout, until my host told me that he’d just got back from a 3 week European tour – during which he’d clocked 3,500km (almost half what I’ve done in total)! I took the scenic route along the ‘horn’ the next day, as the main road went through a massive 3.5km tunnel which I didn’t fancy. The road was difficult but I was rewarded – for the first time in weeks I had large chunks of the day all to myself and the route was beautiful. 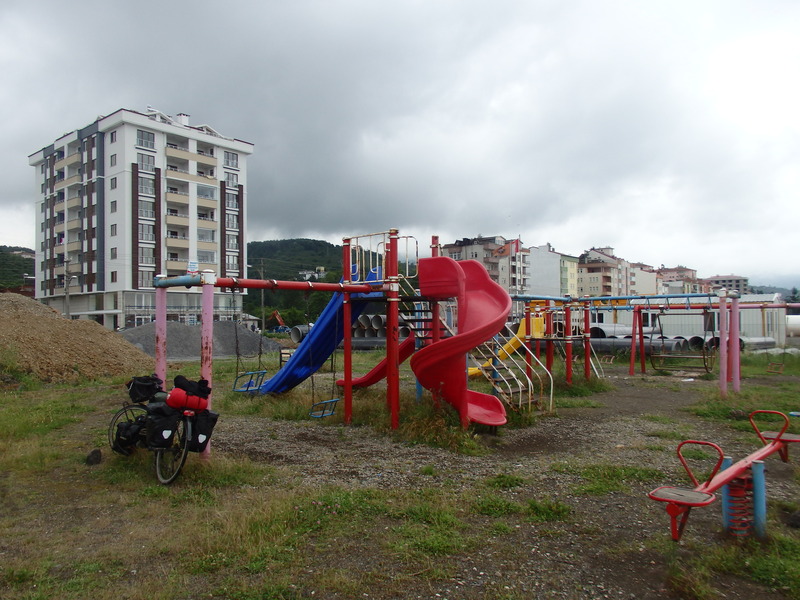 Ordu was a nice town. My host was a school teacher and I was invited to attend his students graduation. 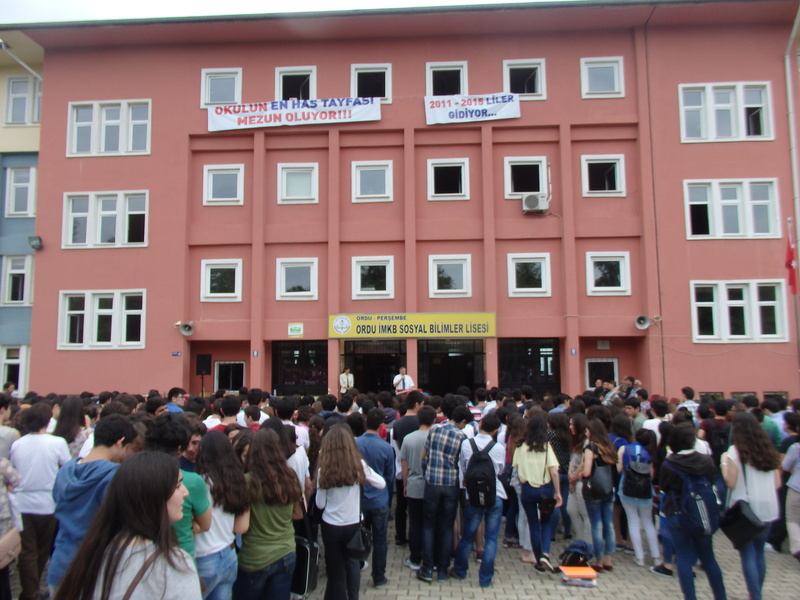 School buildings are funny in Turkey – they all look like prisons. Nothing like the red brick old ones I went to. Before we said bye I had to take a hundred selfies with the students – the Turks are obsessed with smart phones and selfie culture – more so than Brits I think. I visited my host’s village up in the mountain. His family (like everyone else in this region) grows hazelnuts. 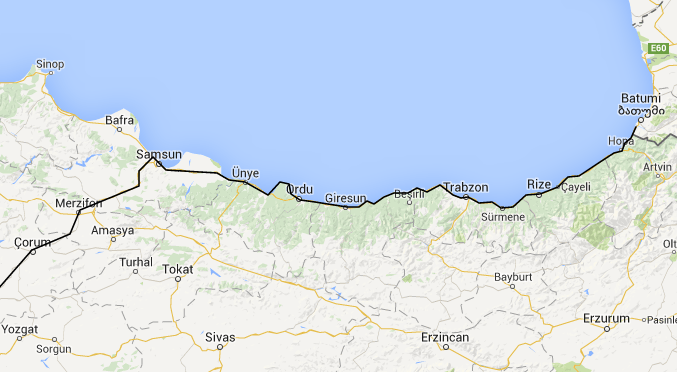 As I’m frequently reminded here – 70% of the world’s hazelnuts are grown in the Black Sea region. 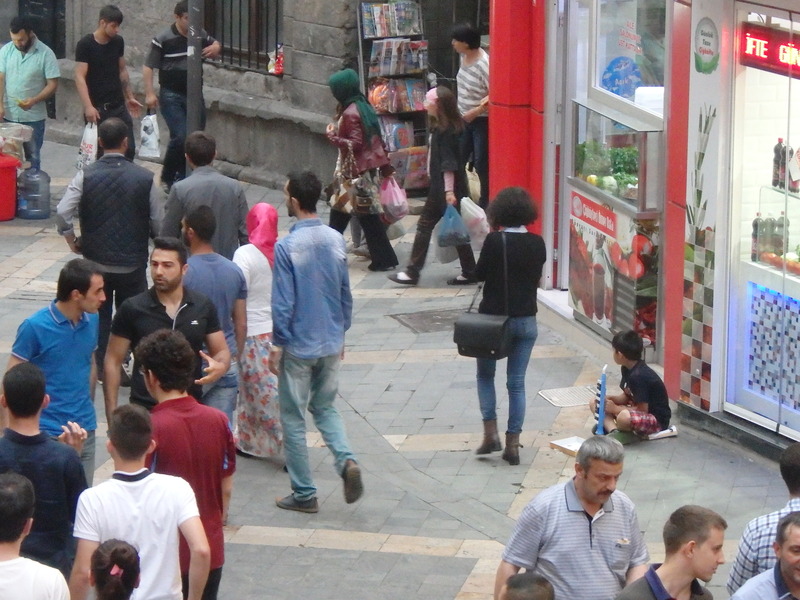 Everyone in Turkey seems to have a ‘village’, I’m frequently asked if I have one, a question I thought odd at first but now I understand – as everyone here still has a strong connection to the village from where their family probably moved into town. Often families have a flat in a city and also their village home and farmland out in the country. 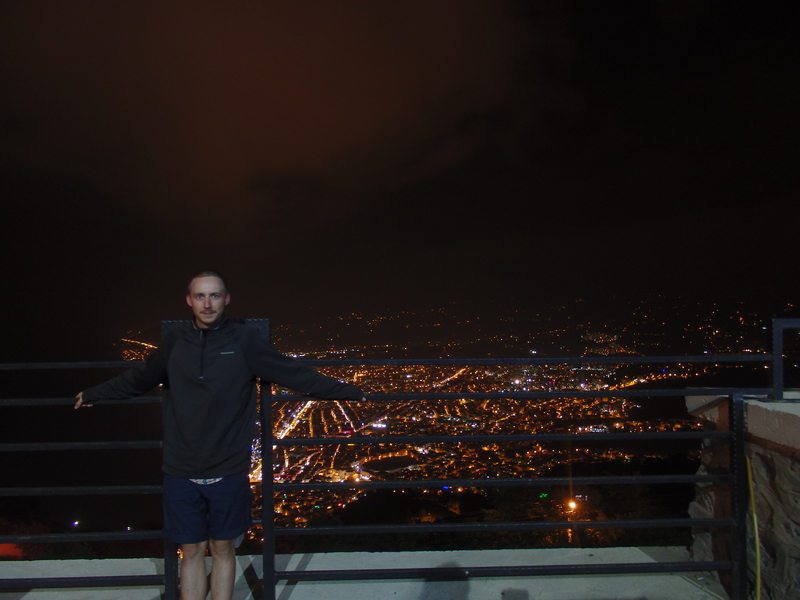 Before I left Ordu I went up the new cable car to the mountain top, where I was rewarded with a great night time panorama. On Friday I was invited to Friday prayer – the first I’ve attended. 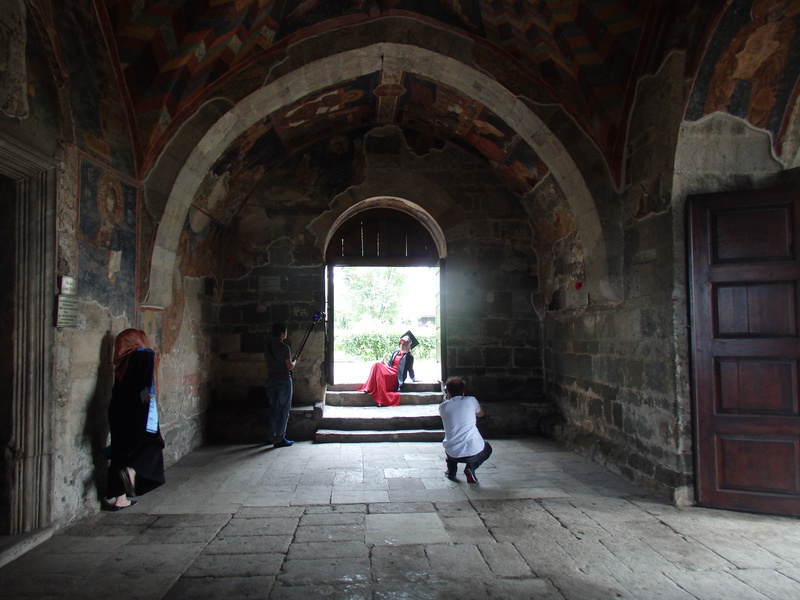 It was a good experience – I was mainly interested because I’ve never really been inside a village mosque, only the big touristy ones. The guy I was with kindly instructed me what to do and translated what the imam was saying, when suddenly he whispered in my ear (with sarcasm, I might add) ‘and now he says – ‘go to Syria and fight with your brothers!” at which point I had to bite my lip hard for 5 minutes in order not to burst out laughing at such an inappropriate time. I couldn’t believe he’d made a joke like that in there! 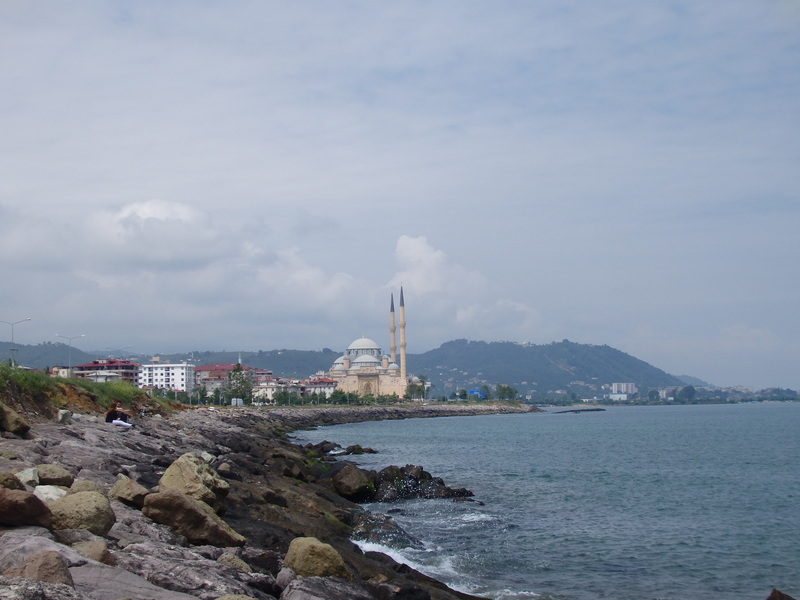 I stopped in the town Giresun to check out the castle there. Going up was a good idea in hindsight, but not climbing the hill by bicycle – it was one of the steepest and hardest hills I’ve had to climb up. The castle ruins weren’t particularly exciting, but the view was beautiful – big mountains surrounding the town as it stretched along the coast. 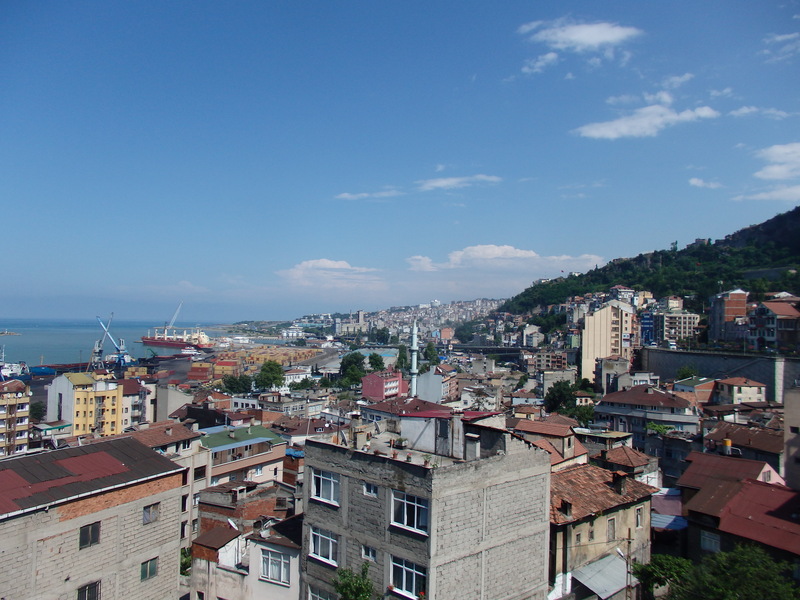 Finally I arrived in Trabzon. I prepared my documents and went first thing in the morning to the Iranian consulate. I was super nervous, and after the debacle with the Uzbeks I was expecting the worst. There were three other tourists there – a Kiwi, South African and Irish (no pun coming). We were called in and sat down while an angry looking man (I guess always being angry is part of the job description if you work in an embassy) called us up one-by-one. At one point one of the girls started to chat to her friend and was told off – so we sat their in total silence, feeling like we’d been called to the head teacher’s office for a telling off. Because the visa situation and embassy reports are in a constant state of flux – I’ll say exactly how it worked for me, and provide some updated info (sorry if this is boring). Also I might add that you can only enter Iran with a guided tour if your British or American, so today I am on my Danish passport. After checking our passports and our Letter of Invitation codes (you have to have this now – it’s impossible to apply without. Costs about €30 and takes a week from a travel agency. I used Key2Persia), he then sent us away with a list of errands and told us to come back at different times. I had to deposit €50 in the bank (the Irish and South African had to pay €40, but the Kiwi €100), fill in the application form, photocopy of passport and Turkey entry stamp, bring two passport photos and proof of travel insurance. The last one was the only problem for me – my insurance was expiring later this month and I hadn’t extended it yet. I’d only remembered that Saturday evening, and of course I couldn’t call the insurance company on Sunday. So I waiting anxiously until 11am (9am UK time), called them up to extend – ran to the print shop to make a copy of my new certificate and rushed back to the embassy in time to return the documents. We were all told to come back in three days. I was pleased that everything looked to be in order but dissapointed that it would take so long – I’d been under the impression that it would be done by the next day. 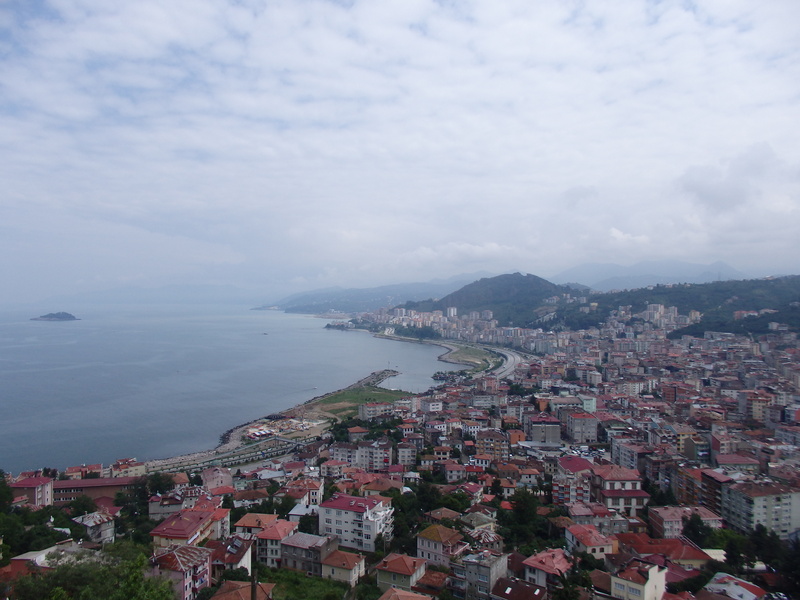 Trabzon used to be the ‘go to’ place for Iranian visas but it seems the party is indeed over. (I recently spoke to someone who got it much quicker in Erzurum). 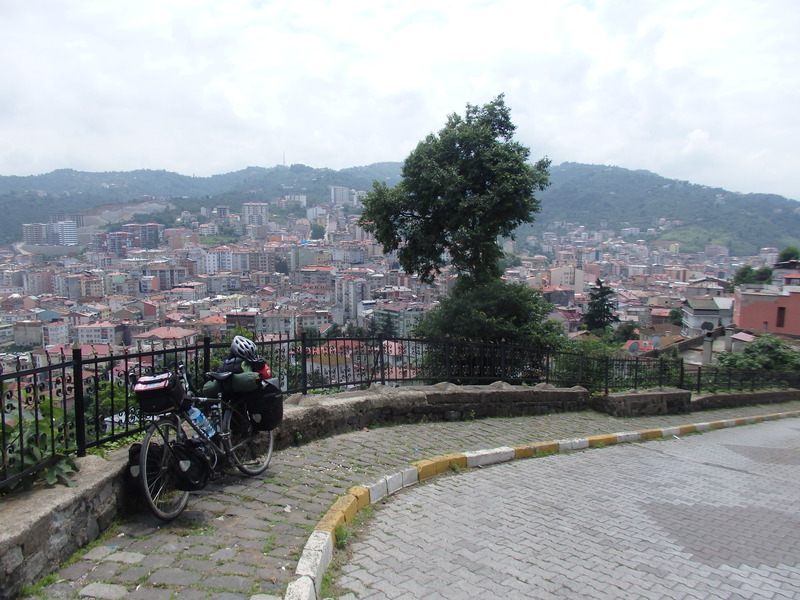 So I had some time to kill in Trabzon – luckily there was stuff to do. 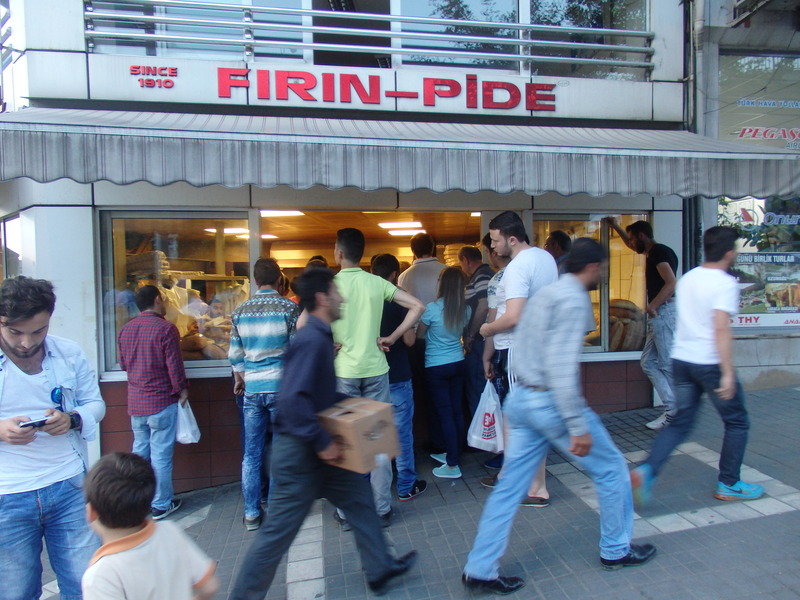 Many of the Turkish towns I’ve visited are very ‘samey’ – same fast food joints, same pastanesi bakeries, same cay houses, cafes etc. There’s very little history on show which makes it a little less stimulating to explore than Europe. 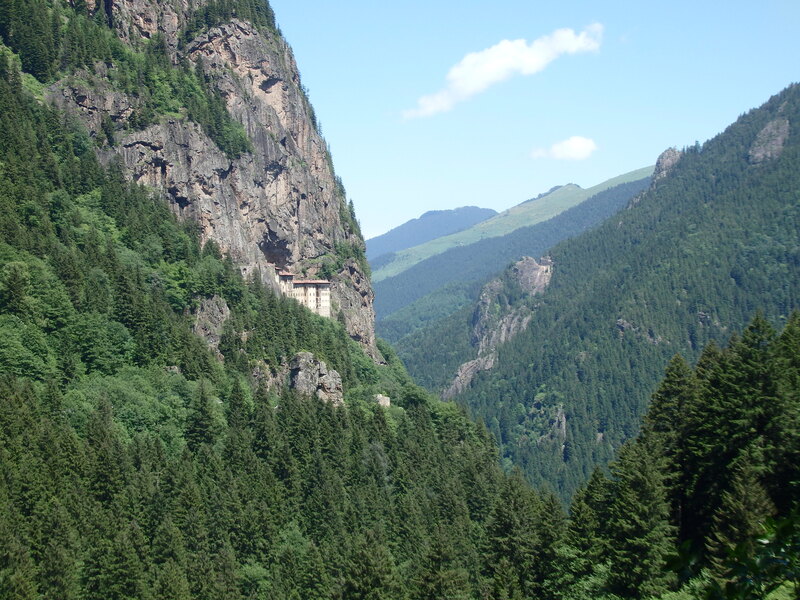 Trabzon is an ancient city though – and there was an impressive old town wall along the cliffs that cut through town. 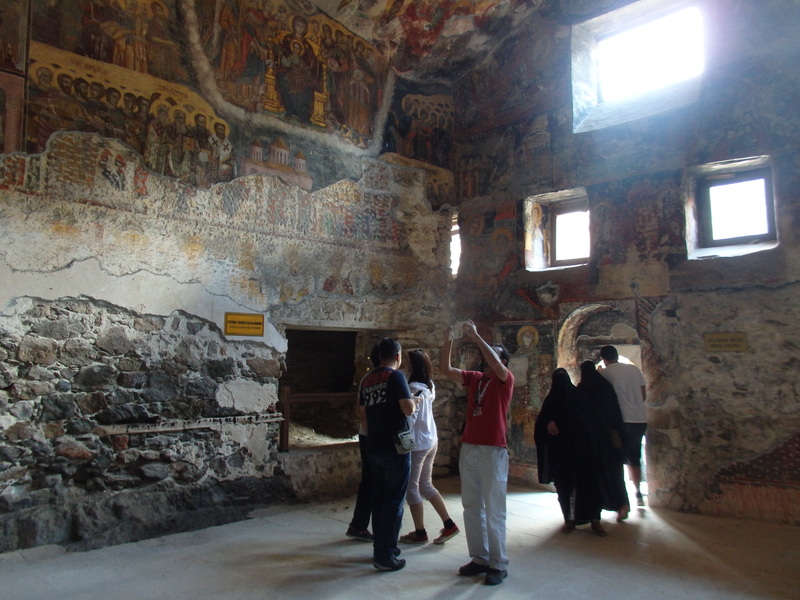 I visited Hagia Sophia – an old church that has now been converted into a mosque. 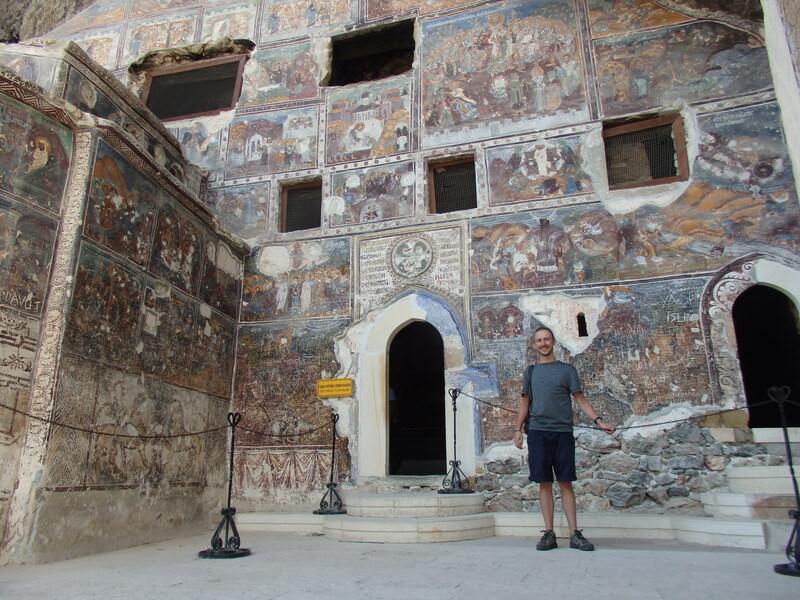 It was strange to see the Christian paintings on all the outer walls with a functioning ‘plastic’ mosque inside. The number of Syrian refugees here is really startling. If you sit outside a cafe in the main square you’ll be asked for money numerous times before you can finish your drink. The kids all sell tissues or play toy flutes in the street, and so the pedestrian areas are filled with strange melancholic melodies that don’t really make sense, but loiter in the air around each corner. 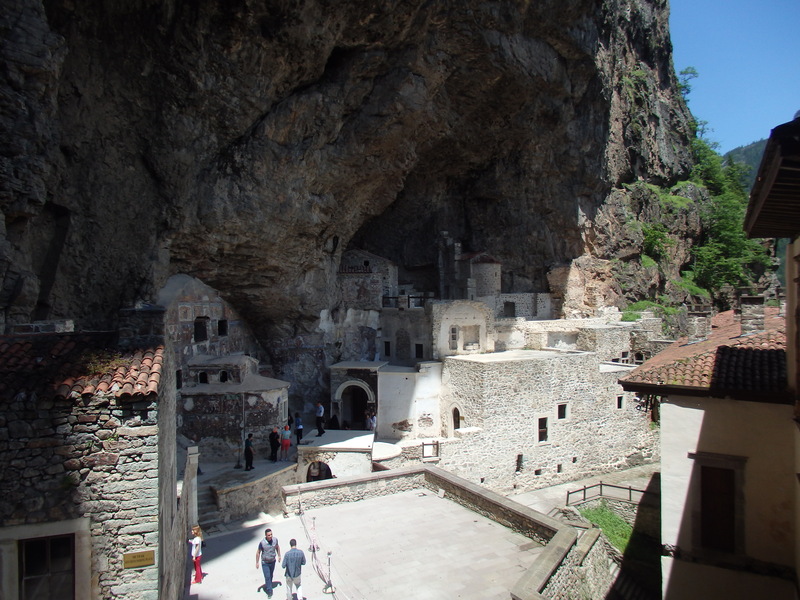 I made the essential excursion up to Sumela Monastery – what a place! I was considering cycling up, but couldn’t be bothered to make the 1,500m climb up the mountain. 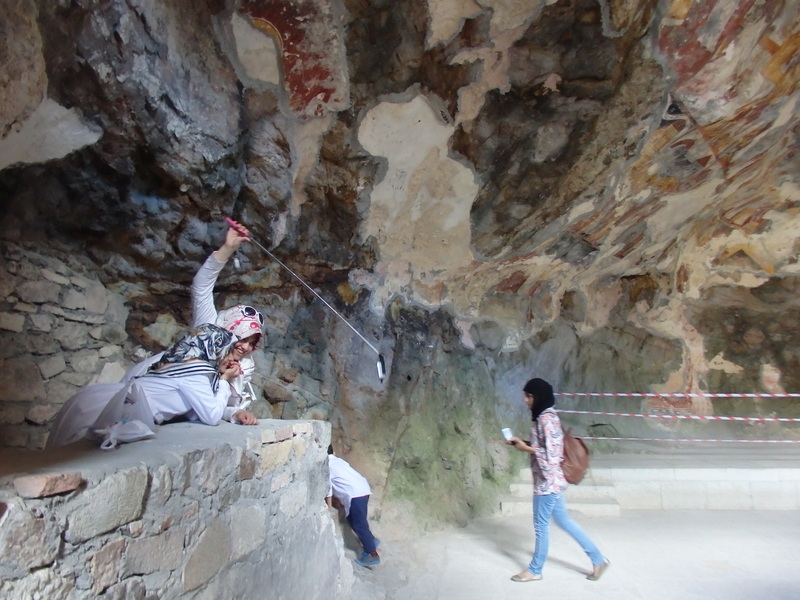 I looked into taking dolmus (minibus) to the national park to hike up, but that seemed too complicated so I accepted defeat and took a tour transport (up and down for £7.50). It doesn’t actually take more than about half an hour to look around the site. 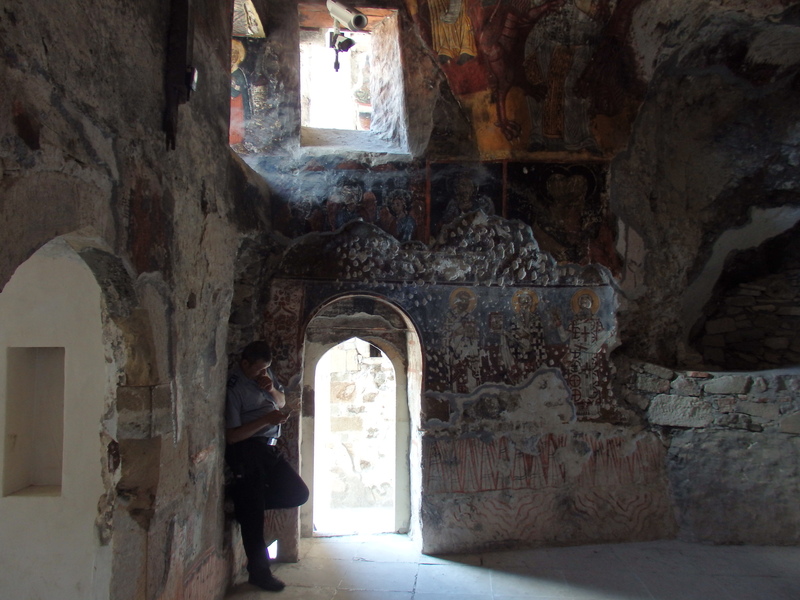 The frescoes were really amazing, despite being heavily vandalised by graffiti over many years. There were loads of tourists – something I haven’t seen since I was in Istanbul. I had lunch with a couple of Turks who were on the same bus as me – once again I found my meal being paid for by strangers. I’ve been really amazed and touched by Turkish hospitality – it’s true what everyone says – the Turks are an incredibly welcoming and generous bunch. Everywhere I go, people are interested in me. They don’t look at me like I’m a cash machine, and when they talk to me they seem genuinely curious and impressed about my trip. They ask intelligent questions about UK and what I think of Turkey and are keen to make sure I leave with a good impression of their country. 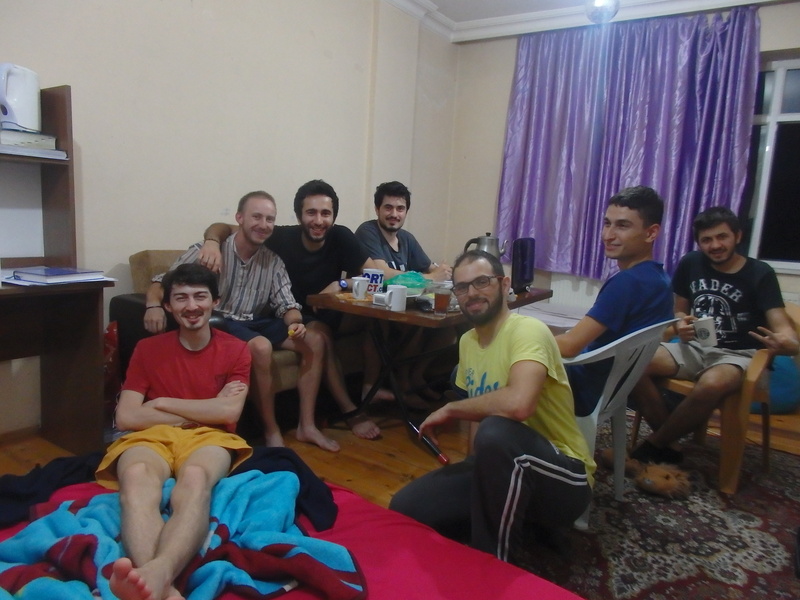 The Warmshowers/Couchsurfing hospitality communities are strong in Turkey, but even strangers have given me cay, invited me into their homes, fed me, bought me meals on more occasions than I can remember now. The way Turks interact with strangers makes me feel embarrassed about England – how would they feel if they traveled in the UK and no one even wanted to make eye contact with them? After three days of doing a lot of nothing I went back to the consulate with butterflies in my stomach. When I left I had my visa in hand! I wanted to go for a celebratory drink. I’ve hardly had a drop of alcohol in Turkey as it’s so bloody expensive. 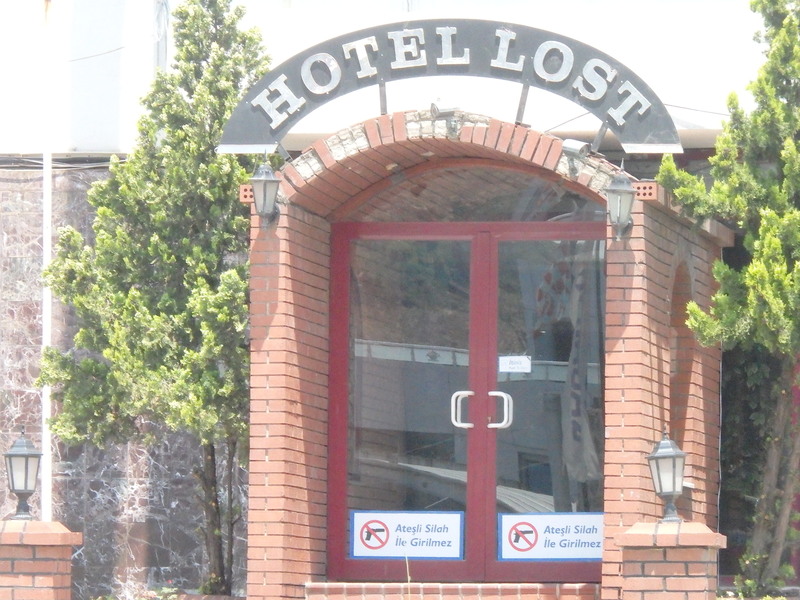 I went to the one pub in town – but it was closed! Today was the start of Ramadan. 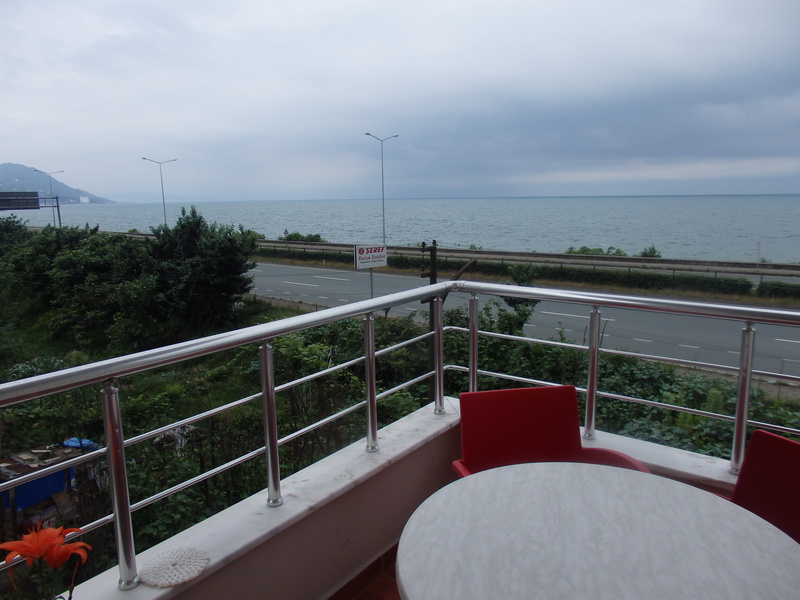 I don’t think the Turkish are too strict about it in much of the country, but this area is a little more conservative and the difference was very noticeable – many of the restaurants were closed and they were all getting extra tables out for the 8pm feast. Respect to the Muslims here – the hours of fasting now is something like 17 hours, so much harder than in winter. I said goodbye to my kind hosts – a bunch of students I’d been staying with who’d been happy to have me extend my stay despite the fact that they were all drowning in exams. 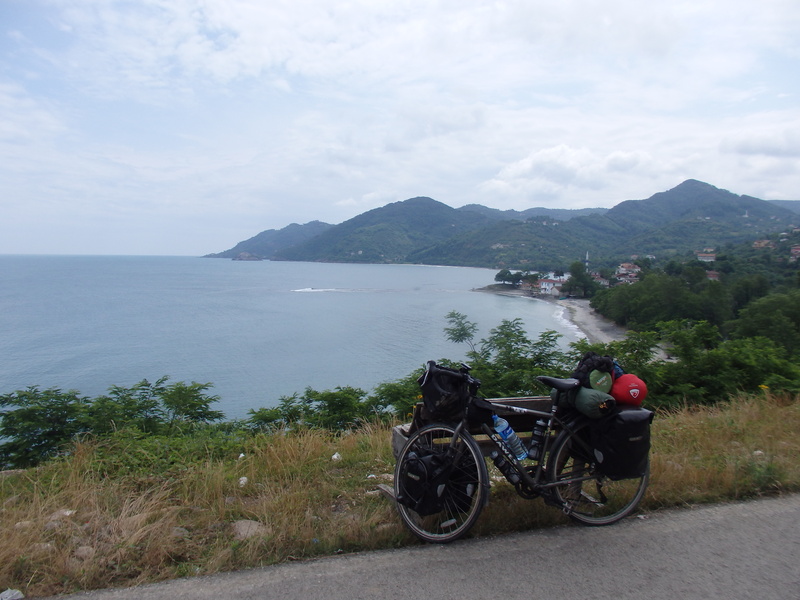 I cycled on – by now I was a little bored of the coastal road. I’d expected it to be nicer, and I can’t see why cyclists like it that much, aside for its convenience. After a while the sea and mountains aren’t that exciting and the road is still just a motorway. 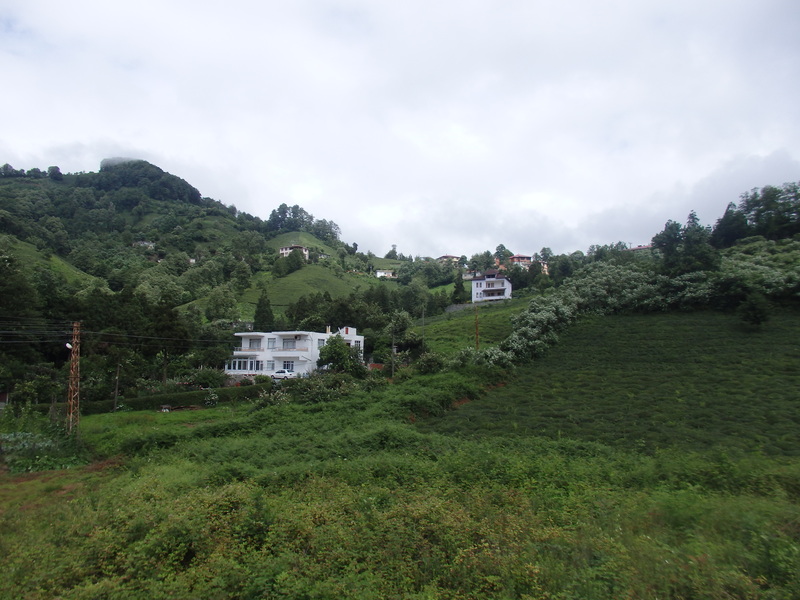 The hazelnut farms slowly turned into tea plantations. 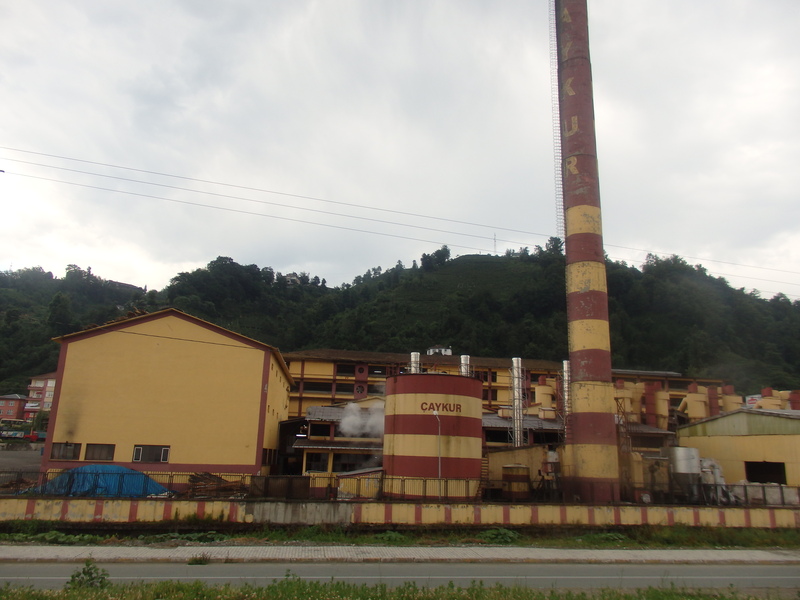 From time to time I passed a rusty old cay factory and was drowned in the smell of tea. 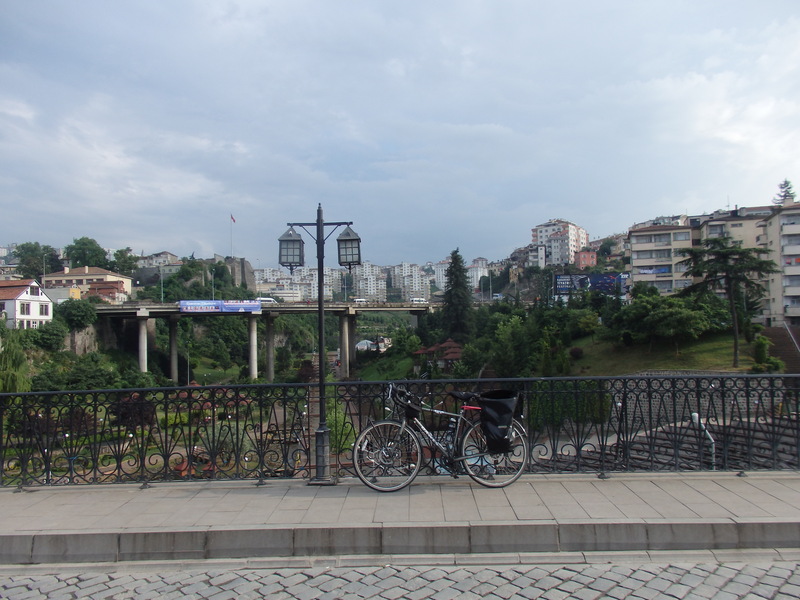 In Rize huge posters (I mean huge – the size of buildings) of Erdogan were draped everywhere. It was a weird sight – that part of Turkish politics is odd. No politician in England would ever be worshiped like that. Respected, maybe, but having someone’s face plastered everywhere on such a scale feels a little ‘big brother’. I was later explained that he is actually from Rize, which clarified things a little. I carried on in the constant rain that lingers above the mountains and occasionally nips down to the coast. 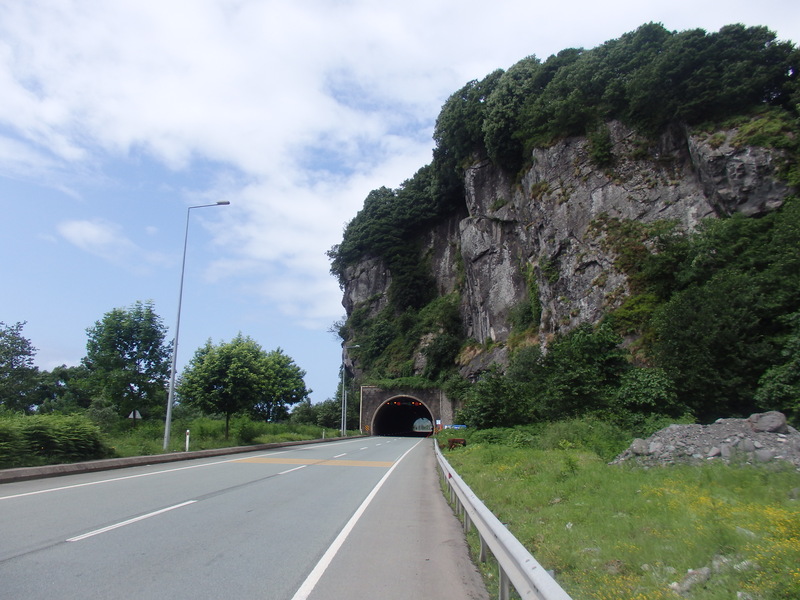 The mountain cliffs dropped dramatically just before the road, and dozens of tunnels had been cut into them for the road to pass. And then, just like that, I was in Georgia. 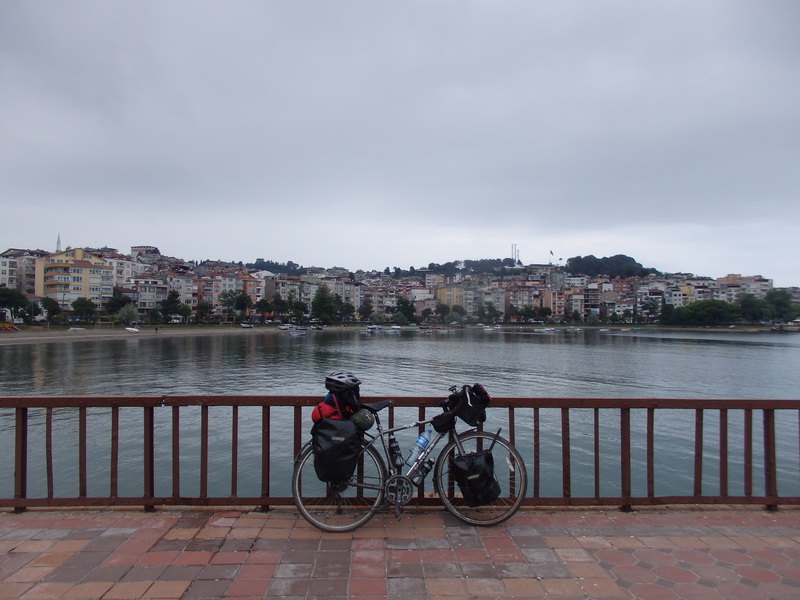 I’ve loved cycling in Turkey – the experience has been frustrating at times, but immensely rewarding. I feel physically and mentally stronger than when I arrived, and well prepared for my adventure East. I’ve made a few mistakes in my road choice – but I’ll blame the visa runs for the times spent on the motorways. The weather has been awful at times, but perhaps I’ve just warmed to the sunshine. It’s the people though, that have made the country such a wonderful place to travel. Everywhere I’ve stopped I’ve been blessed by warm welcomes and generous hospitality and for that I’ll be feeling grateful to the Turks for a long time.